Hi, Nancy Hill for Tutti Designs Team and every Tuesday, I am excited to share a card with you using another gorgeous Tutti Designs die. 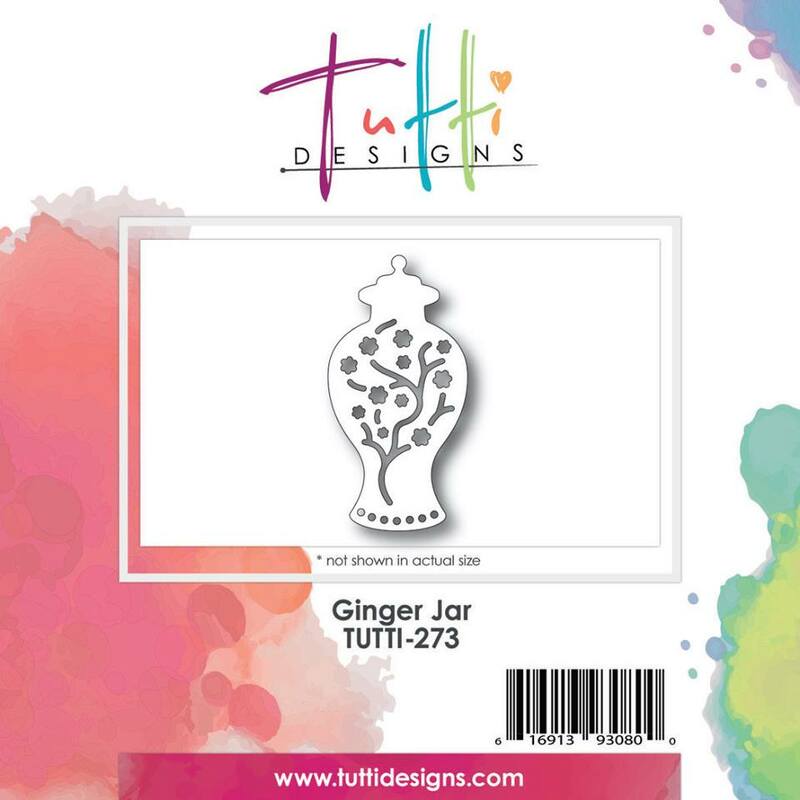 It was a lot of fun thinking about how to show case this gorgeous Tutti Designs' Ginger Jar die but came up with this card and hope it inspires you to create your next cards using these gorgeous Tutti Designs oriental dies such as this Tutti Designs Ginger Jar. You will want to see the rest of the gorgeous February Tutti Designs oriental dies by clicking HERE. 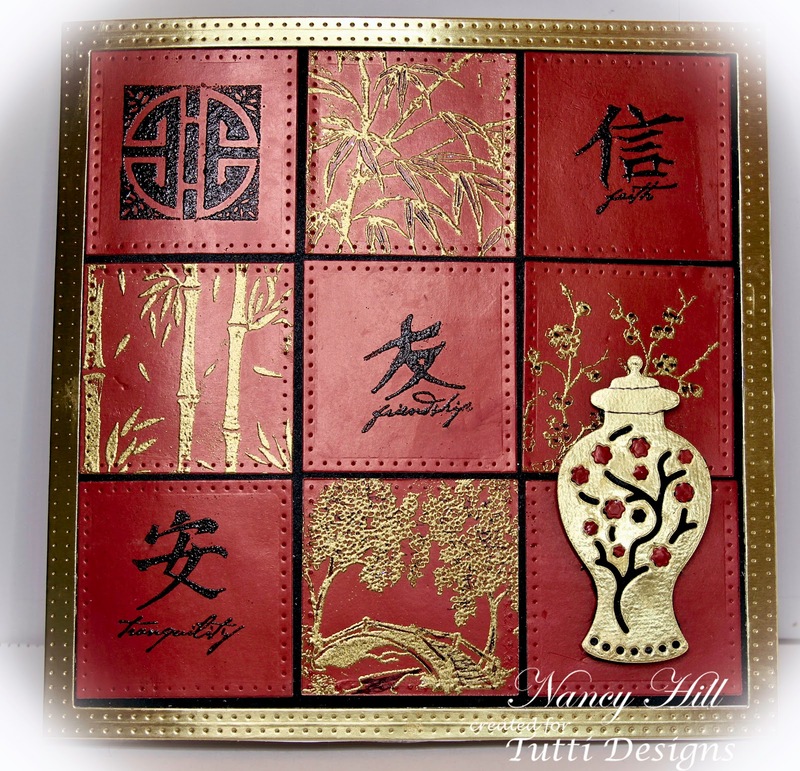 Cut out 9 2"x 2" square with rust card stock and stamped each square with black or gold embossing powder. Use a super fine point black ink pen to parts of the stamp designs. Adhere each square on a 7" x 7" black card stock. For the main base of the card, cut a 7" x 14" and score in the center and fold (I always use a Ghost Line Poster Paper for my larger cards in order that the card won't warp and and will hold the shape). Cut out a 7" square frame using gold metallic card stock. Adhere as shown on photo on card. Cut out Ginger Jar with black, rust and gold metallic card stock. Adhere the flowers and branch on the jar. Adhere the Tutti Designs' Ginger Jar with 3D glue dots to the card. Refer to my tutorial about using fabric softener sheets to do this technique and save a lot of work and time by clicking HERE. 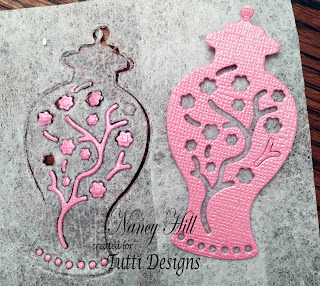 This technique is very good about cutting out intricate dies as well as saving the tiny pieces for projects such as using these little flowers from the Tutti Designs Ginger Jar die. I just peeled the jar and the tiny flowers stay on the fabric softener sheets. Make sure not to use the fragrant fabric softener sheets since the tiny pieces will be too hard to get off and it leaves a film on the pieces as well as the large die cut.